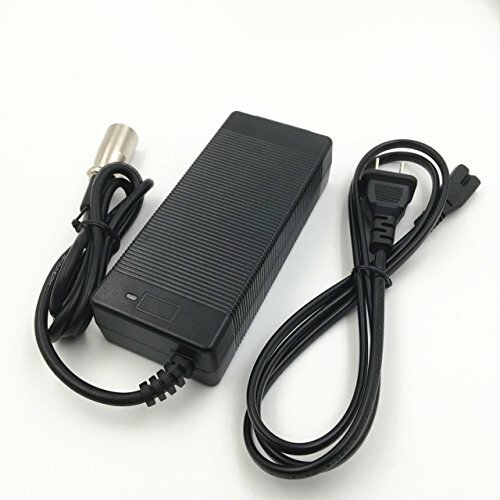 The charger is for 7 series lithium battery,with XRL connector for 7 series li-ion lithium battery pack,for 24V 7S lithium battery pack for electric bike,for skate board, for electric scooter.Red light -- charging , green light -- charge OK, it stop automatically when the battery is full. 1. Appearance: The shell is made by High-quality plastic, smooth appearance, have no impurities. 2. Protection: Short Circuit Protection/ Over current Protection/ Over Voltage Protection;Red light -- charging , green light -- charge OK, it stop automatically when the battery is full. 3. Built-in: 105℃ output capacitor, Global applicable AC input voltage, High efficiency, Soft starting current, reduced the impact of AC input effectively, small size, light weight,100% full load aging test, Internal EMI filter, ripple minimum. 4. No Fan: No fan, no noise. The charger have fan with simply built-in, can absorb dust and pile up easily then get burn. Our fanless design have a strong built-in ,with radiating fin surrounding the broad, dissipating the heat through the shell, So some hot on the shell when charging is very normal, but it is durable. 5. Current &voltage: The precision of our product's current between±0.1A, the voltage tolerance is±0.1V, absolutely not virtual marking. If you have any questions about this product by Jnenconn, contact us by completing and submitting the form below. If you are looking for a specif part number, please include it with your message.